From May 2016, the Thurrock Marching Brass design team started working on what they hope will be an incredibly fun filled field theatrical experience. The show will once again take an historically known subject matter and extends the story line, just as they successfully did with their 2016 program, Under New Management. For the 2017 season, Thurrock Marching Brass is delighted to announce that they will bring the show “Charlie’s Chocolate Factory” to the field for your enjoyment. 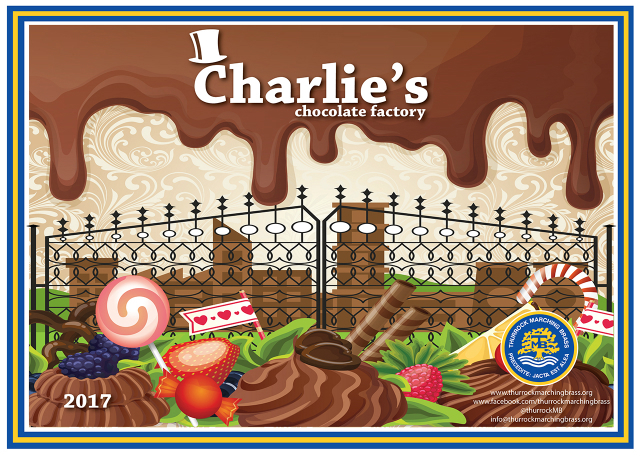 Extending the Roald Dahl smash hit Willy Wonka and the Chocolate Factory, which starred the late, great Gene Wilder, our story starts with Charlie Bucket receiving the keys to the whole world of Wonka and to the amazingly colourful factory that centres the entire story line. Act 1: Look what I’ve got! Act 5: I Did it! Speaking of the announcement, Thurrock Marching Brass’ Corps Director, Jay Lindner says “We have all been really excited to announce this show for some time now, as work has been going on in the background to look at how we can bring it to the field, and to take it on the road. What I can say is that logistically this will be one of our most difficult productions, but we are going to be pushing the members to extend what they have already learned from the first year of looking at things differently in terms of performances. Our decision to focus on theatrical elements and to incorporate our performing arts groups into the marching band has worked so well for us and we will be extending that for our 2017 production, Charlie’s Chocolate Factory. With a 100% member retention from the 2016 season, and new members coming on board all the time right now, I couldn’t be any more pleased with everyone involved in this great organisation. Together we hope to create something that everyone will really enjoy and 2017 already looks set to be one to remember”. Posted by News Editor on Monday, October 31st, 2016. Filed under Drum Corps U.K., FrontPage Feature.